Should you be concerned about lead in paint? If your home was built prior to 1978 and you are going to disturb the paint – i.e., sanding, sawing, then yes. For two reasons: 1) health concerns; and 2) The EPA’s Renovation, Repair and Paint rule. If you wonder why the contractor you are considering hiring is adding some costs to your remodel project to deal with lead based paint, that is why. He or she could suffer from large fines if they are not RRP certified and do not follow the guidelines set out by the EPA for renovations in homes with lead based paints. “Why Do You Need to Be Concerned About Lead? Lead is a toxic metal that was used for many years in products found in and around our homes. Lead also can be emitted into the air from industrial sources and leaded aviation gasoline, and lead can enter drinking water from plumbing materials. Lead may cause a range of health effects, from behavioral problems and learning disabilities, to seizures and death. Children six years old and under are most at risk. Rose Construction, Inc. is an RRP certified firm and our employees are certified as well, through taking the EPA approved classes. Older home renovation project - lead check important! I found an excellent website with all the information anyone could want on the topic of renovation and how the EPA’s law affects your renovation project in that 1978 or older structure. Whether you are a homeowner or contractor this website provides all the information you could want! We recieved our EPA logo with our companies certification number embedded in it today. Just thought we would show it to you! For information on current rules regarding renovation in older homes (pre-1978) that may contain lead-based paint, you can go to the website: www.epa.gov/lead. Lead paint gets into our bodies through swallowing something with lead dust on it or through breathing air that has lead contaminated dust in it, such as when sanding surfaces painted with lead containing paint. It is hazardous both to adults and children, but more so to children, due to their small size and their still developing bodies and brains. Homeowner’s doing their own remodeling are not required to follow the EPA rules, but it would be wise to use the lead safety precautions just to be on the safe side. 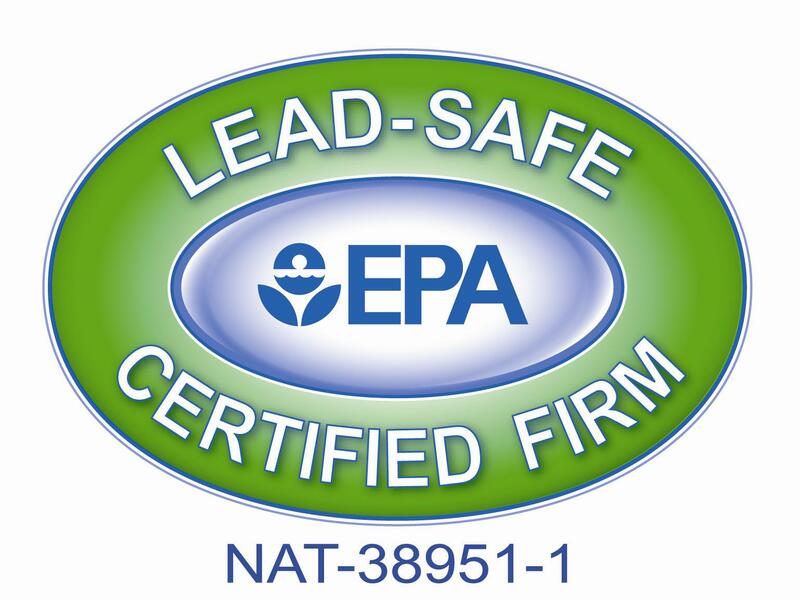 Is Your Remodeling Company EPA Certified for Lead Renovation? This Thursday, April 22, home remodeling companies working in pre-1978 homes are required by the EPA to be certified in lead-safe work practices. Many homes built prior to 1978 were painted with lead-containing paint. You may think this is not a problem since the walls have undoubtedly been repainted since then, but when a carpenter tears out a portion of a wall with lead based paint on the bottom paint layer, a lot of dust is created and that dust will contain lead particles. The dust could then be breathed in by anyone in the home if it is not contained properly, or it may fall as a fine layer of dust on any surface. This dust will be cleaned up at some point and may end up in your vacuum cleaner, or as dust adhering to the walls, or be deposited in your carpet. At some point the hazardous dust will get into your living space and if there are children or pregnant women living or frequently visiting, it can have harmful effects. That is why the EPA has required that all home renovators be certified in safe methods of work and cleanup, ensuring that the residents are not affected by lead containing dust. Rose Construction, Inc. desires to provide the best remodeling for our clients and to do so safely, our master carpenters and our company have been certified to perform this work according to EPA designed procedures. The following link takes you to the EPA’s brochure that home remodelers are expected to provide to homeowners of pre-1978 homes, explaining the dangers and what to do to remodel your home safely. Rose Construction now has a Certified Renovator for safe renovation techniques when working in homes with lead paint. Our Project Manager, DyLon McClary, CGR, received his Lead Safety Certification for Remodeling, Repair and Painting, on March 23. The new EPA regulation goes into effect on April 22 this year. The Rule requires that strict procedures be followed during renovations in homes built before 1987 that disturbs more than six square feet of potentially contaminated painted surfaces if that home is inhabited or frequented by pregnant women or children under the age of six. The required practices during renovation and cleanup are quite rigorous, including the posting of warning signs, setting up dust containment zones, and specified cleaning and waste disposal procedures. The clean up must be supervised by a certified renovater. However, if there are no pregnant women or children under 6 living or regularly frequenting the residence, the rule allows the homeowner to “opt-out” of the lead renovation requirements by signing a statement to that effect.